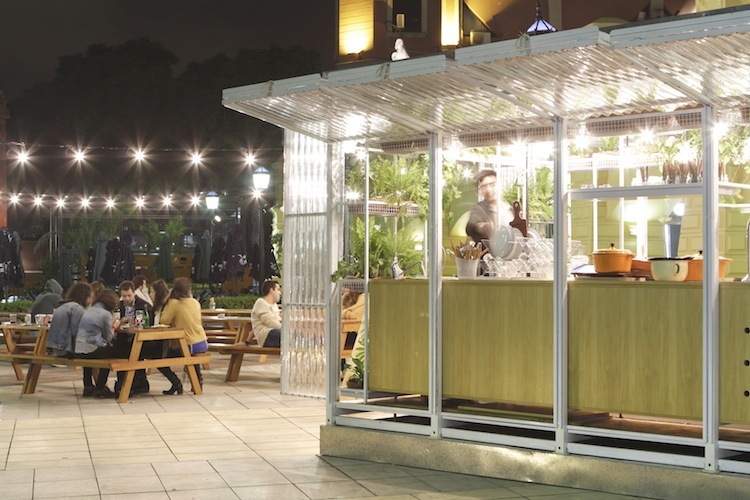 Nicknamed the Green Lantern, this portable bar in Buenos Aires saves the day (and the night). This airy, prefab bar was a perfect visual representation for the adventurous Argentinian outdoor and lifestyle brand. Facu Fernandez and his colleagues Nati Lucero and Maxi Ciovich built Refugio for Camping, a culinary concern that wanted a space that reflected its focus on local beer and wine and the outdoor lifestyle. With its small footprint, garden of plants and transparent exterior, the Refugio project captured that sense of openness, versatility and abandon. It Met added a dozen custom tables to complete the casual outdoor space. A series of five big metal rings linked by a four longitudinal beams forms the skeleton of the structure, built in studio and assembles on site. Clad in transparent sinusoidal polycarbonate sheets and filled with furniture crafted by the trio from guatambu hardwood panels, it can be easily disassembled, transported and then assembled again. There are plans to build additional mobile structures similar to Refugio, as well as commercial displays and more furniture, but at the moment, the multidisciplinary It Met is content to sit behind the bar’s three taps and take it all in. The structure's clear frame and adjustable sides makes it ideal for taking advantage of warm summer weather. It Met Estudio is already working on similar outdoor structures, focusing on more flexible arrangements for portability. It’s a concept that represents salvation for those of us who have sweated through a humid urban summer —and perhaps an idea ripe for feature placement in a beer commercial. Perched on a rooftop in Buenos Aires’ hip Recoleta cultural district, the Refugio de Camping, a prefab bar built by a trio of architects from It Met Estudio, is ostensibly an 18-by-8.5 foot pop-up party. Fernandez, along with his colleagues Nati Lucero and Maxi Ciovich, built Refugio for Camping, a space that reflects its focus on local beer and wine and the outdoor lifestyle. With its small footprint, garden of plants, and transparent exterior, the Refugio project captures that sense of openness, versatility, and abandon. It Met added a dozen custom tables to complete the casual outdoor space. A series of five big metal rings linked by a four longitudinal beams forms the skeleton of the structure, built in studio and assembles on site. Clad in transparent sinusoidal polycarbonate sheets and filled with furniture crafted from guatambu hardwood panels, it can be easily disassembled, transported, and then assembled again, with the furniture forming a simple interior perimeter and giving the "box" more depth.